KEITH'S WARGAMING BLOG: Kradschutzen Vorwarts! Inspired to represent an action by German motorcycle infantry (or kradschutzen, see previous post), I came up with the following scenario. September 1939. German motorcycle troops, supported by a reconnaissance battalion, rush to seize an important bridge before the Poles can claim it for themselves. 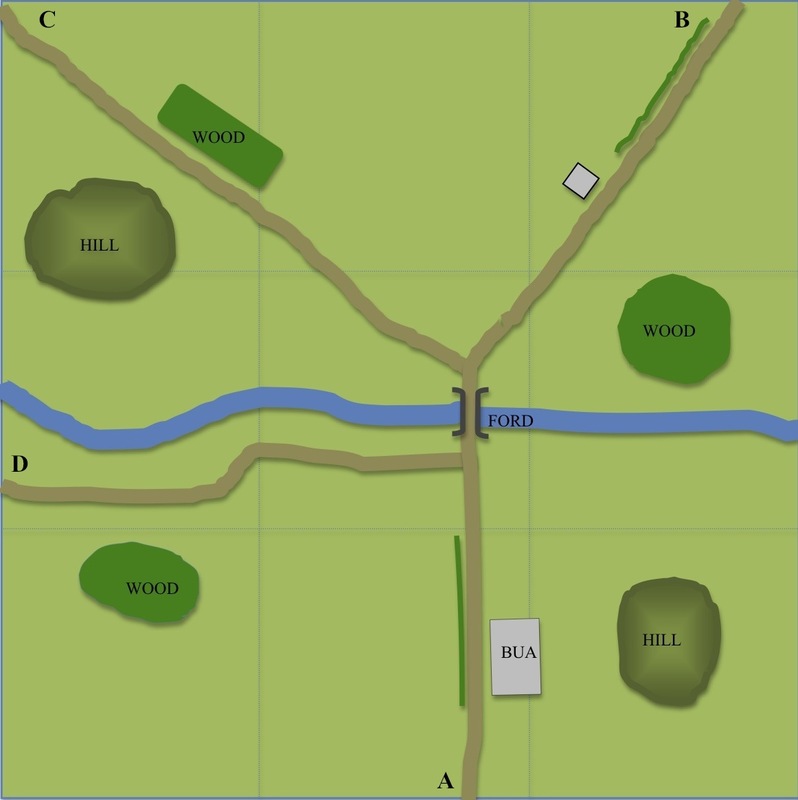 The map for the game is shown below, using a 6' x 6' table. For a change I decided to make up a basic map in colour using Microsoft Word, which was actually easier than I feared. In fact I was pleasantly surprised at how little swearing and cursing was required to make the software behave as required. The idea is that the stars of our show, the Kradschutzen Battalion, automatically arrive in column on road A at the start of the game, and have 2 free moves to make for the bridge (command rolls permitting). On move 3, their supporting Aufklarungs Battalion can enter along the same road, but using mobile deployment to arrive. The Poles can also start to arrive on move 3. One Polish formation is allocated to each of the roads B, C, or D by dice rolls, entering the table in column by mobile deployment. The German CO can try to arrive from game start on road A using mobile deployment. The Polish CO can be allocated by the Polish player to any road or formation at the start of move 3, but must also use mobile deployment to arrive. Game length was set at 8 turns. The bridge and ford count as a single objective, and the side occupying the objective at the end of the game wins, unless either side has broken in the meantime. The ford can be crossed by any unit but attracts the dense terrain command modifier. The table is set up and ready to go. The motorcyclists arrive along with the CO and are able to move forward. But there is a delay - the lead unit encounters a stray mine on the road and is knocked out (command blunder with a roll of 5). They managed to overcome this setback but after 2 turns the motorcyclists are still not quite at the bridge. The Polish tank/infantry group arrives straight away on move 3. The Poles have a -1 command penalty for ordering combined infantry/tank formations, so the CO accompanies them to keep things moving. The cavalry also arrive smartly. They ended up being lucky with their command rolls throughout the game, and they moved rapidly towards the objective. The Germans, however, beat them to the bridge and ford. The bad news is that the Aufklarungs Battalion stubbornly fail to arrive. The Polish cavalry move forward bravely and deploy to attack the bridge. The Germans dismount from their motorcycles and trucks and set up a modest bridgehead.They are able to knock out an advancing Polish recce unit with MG and small arms fire. But then there is a mix up in orders (yes, another command blunder), and the formation falls back a move, handing the initiative to the Poles. Meanwhile, on Rollbahn A, the second in command of the Aufklarungs Battalion stares down the road. Where have the buggers got to? Surely they're not lost? Whatever the reason, the recce formation still doesn't arrive. Close up of support units from the Polish cavalry regiment in action against the bridge. The Polish recce formation was not much more lively than their German opposite numbers. Their arrival was delayed, and then their movement towards the bridge was sluggish in the extreme. They never got into the fight. The Polish cavalry, with further tanks and infantry coming in slowly from their left, form a firing line and pour fire onto the isolated German motorcyclists. The extra firing dice for veteran infantry is of great value to them, and the outgunned Germans lose units continuously. The Polish tank/infantry formation moves forward slowly, but steadily. The CO took personal command of the 2 tanks. Eventually the tanks and the 75mm were able to commence shelling the German positions around the bridge as the infantry edged forward. At last the Aufklarungs Battalion arrive. But they may be too late to save their comrades. Mortar from motorcycle battalion in foreground. A tragic end to a bold advance. The Kradschutzen at the bridge have been wiped out by a storm of Polish fire, and now the dismounted cavalry swarm forward to claim the objective. The German armoured cars come in sight of the bridge, only to see it covered in enemy infantry. Close up of the FT-17s and 75mm gun supporting the final cavalry advance. The Polish recce formation has hardly moved at all by the end of the game. Final move, and a Polish victory. The game went by quicker than we expected, so in the end we played 10 moves. The Poles were pretty much in control of the objective after 8 moves, and during the extra 2 turns they consolidated their advantage. The Aufklarungs Battalion approached the bridge but ran out of steam as they encountered some solid Polish small arms and ATG fire. Alternative view of the last move. Well done the Poles! A pretty conclusive victory for the Poles. The motorcycle battalion was completely wiped out, and the Germans ended the game with casualties of 11/10. The Poles had not suffered badly, only losing 4/15. The army lists allow some Polish HQs to have a CV of 8 and it was well worth giving this rating to the Polish cavalry, helping them get into the game. At the minor tactical level the best Polish troops were at least the equal of the Germans in 1939, and the Polish cavalry were the elite of their army. For the record, all the Polish horse tows were allowed to move at cavalry speed. Video evidence I have seen on the net shows taczankas and towed 37mm guns galloping around at a great rate with their cavalry colleagues. On the practical side, if you make the horse-towed support weapons move at draught horse speed the cavalry formations become very difficult to use in their historical role. Both players agreed this scenario would be well worth playing again with the roles reversed (on this occasion I was the Germans). It is one of those games which will be different each time depending on how the arrivals work out. I certainly didn't expect the German and Polish recce units to be so sluggish. Finally, the evening passed even more pleasantly due to a highly acceptable Le Pre du Moine 2009 Bordeaux provided (as always) by Paul. That man knows his wine! I tried leaving a comment last night, but my computer was playing silly b*ggers! So, this time I hope it works. A lovely little action and very nice scenario. Good to see the Poles winning. I always enjoy seeing the less 'popular' units on the table so it was with great pleasure to see the Kradshutzen and Aufklarungs Battalions in action. Well done! Linked over from BKC website. Please keep the Batreps coming. Enjoy them very much. figures and terrain. Are those 15mm or 20mm? They balance perfectly with the terrain. They are neither too small (as I often think of my 6mm infantry), nor are they stuffed together on the board. It is all in balance. I have a decent collection of 6mm, which is great for my vehicle intensive battles on the Eastern Front. I have been wanting to work with a larger scale for a while, especially for Infantry intensive conflflict, but I have not determined which one to use yet. Great scenario, and great aesthetically. Are those 15 mm or 20mm? The figures combined with the board are the ideal. I currently use 6mm, and I am not that keen on the infantry, though 6mm is good for vehicle intensive struggles on the Eastern Front. They are also efficient space-wise, but your setup shows a perfect balance of terrain, figures, and terrain. I can see the infantry in detail, but nothing is stuffed together on the board. I could go as high as 25mm, but would like your input. Huge, (love the name), thanks for your kind comments. The figures and vehicles are 15mm. This is my favourite scale for WW2 by a long way. As you can see from other posts I wargame the Desert War in 6mm, which does give a great sense of scale. However, for me 15mm is the smallest scale that really allows you to see the detail on infantry as well as the vehicles. I gamed in 20mm for many years but found it took up too much space. Of course, 10mm is becoming very popular but the infantry are still mostly 'blobs' to me at wargames ranges, even when well painted. You have to pick them up and study them to appreciate the quality, which is usually excellent (and sometimes you have to do the same to find out what they are!). Apologies to the wargamers I know who swear by this scale! Excellent scenario. What rules were used?